Several contributions in this volume focus on the modern Middle East, with other articles examining justifications for war, the return of war veterans, white nationalists, and the activities of the Moral Majority. Maria Markantonatou addresses the blurring of distinctions between civilians and combatants. Udi Lebel investigates how the IDF is being changed by the increasing number of religious-Zionists recruited. Orlee Hauser argues that the experiences of women in the IDF vary depending on their positions and assignments. Bruce McDonald compares the performance of the Feder-Ram and augmented Solow models in accounting for economic growth in Iran. Neema Noori examines the interrelationship of war, the state, and mobilization in Iran. Molly Clever examines the justifications for war employed by both state and non-state actors. Christina Knopf uses relational dialectics to examine US veteran transitions. David Bugg and Dianne Dentice analyze attitudes and perceptions of white nationalists. Finally, Aaron Davis considers the rise of the Illinois state chapter of the Moral Majority in the 1980s. 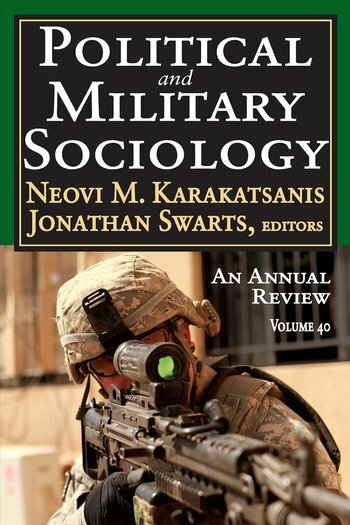 This volume in the Political and Military Sociology series also includes reviews of important new books in civil-military relations, political science, and military sociology.